Categories: Concise Advice Series, Self-help, Simon Tyler. Leading business coach Simon Tyler has spent many years successfully helping hundreds of individuals to overcome the complexity of their business and personal lives, and instead, focus on what is essential and productive. 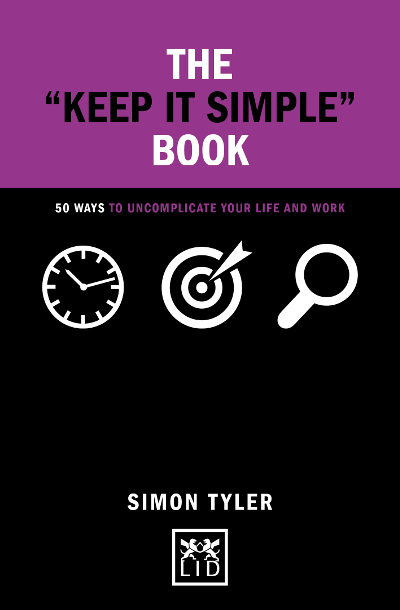 This compact book contains 50 practical tips and techniques to inspire and provoke you to review your life, change old habits and enhance your life by “keeping it simple”. Each tip also contains a lesson or exercise that will challenge consensus thinking, break through barriers and redefine connections through the power of attitude. This is a book that will simplify your life and help you achieve your goals. Simplify your life and achieve more as a result. ● Contains proven techniques used by a leading business coach. ● Our work and personal lives are cluttered and all over the place – this book provides tips and techniques to overcome that. ● Part of the bestselling “Concise Advice”series – stylishly presented (with diagrams and illustrations) and easy to understand and apply. ● Each tip is supported by exercises and lessons to help the reader make a breakthrough. Simon Tyler is the author of The Impact Code (part of The Concise Advice series) and is a much sought-after business coach who works with some of the worlds leading companies.